If you know me, you know I love a good milkshake. 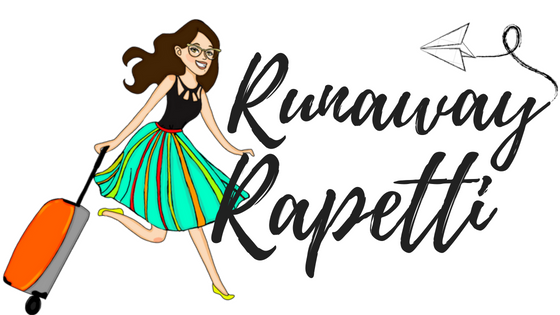 My love of milkshakes dates back to my childhood when my mom would make me her ‘signature’ chocolate-banana shake topped with whipped cream and sprinkles. I thought it was the best thing ever and it had to be healthy because there was a banana in it…right?? Milkshakes are totally my comfort food. Happy? Sad? Meh? MILKSHAKE! 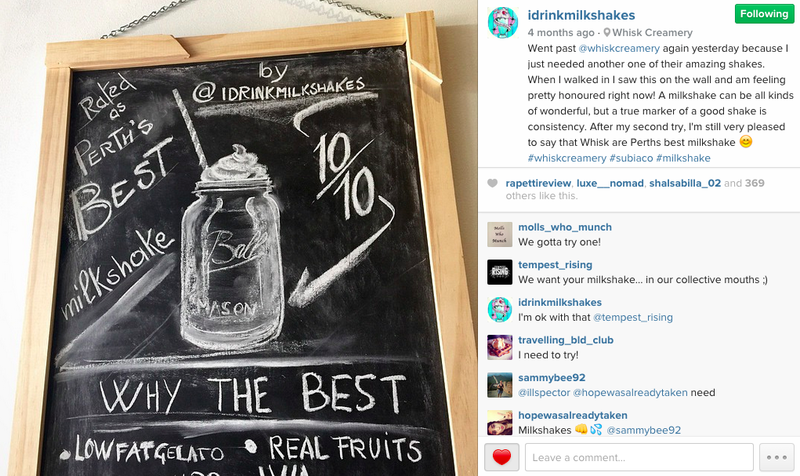 I discovered a fellow adorer of milkshakes through Instagram: @idrinkmilkshakes. 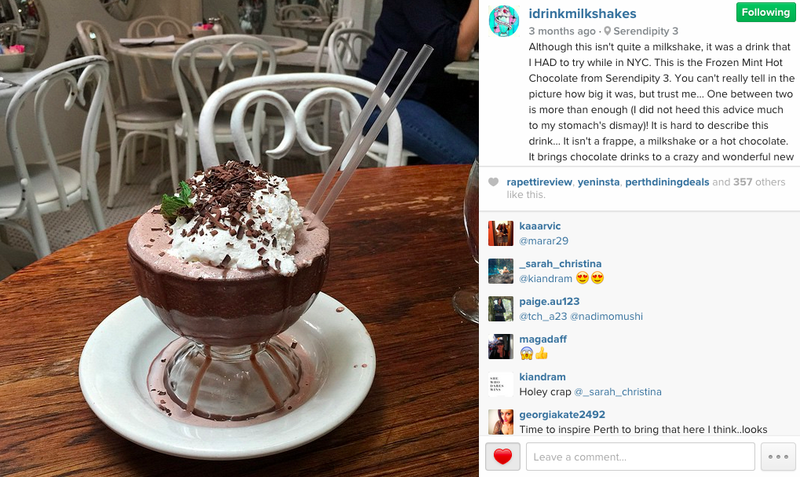 Sam, who started this Instagram about a year ago, is based in Perth, Australia and he’s on a mission to try a milkshake in every country. He now has nearly 7,000 followers which he attributes to people of the world having a passion for milkshakes like he does. I reached out to him and he was kind enough to answer a few questions via email. What is the BEST milkshake that you’ve tried? 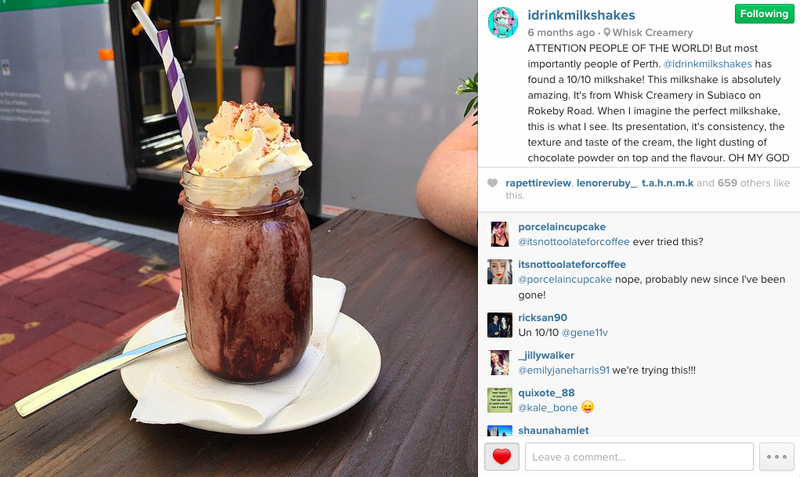 S: The best milkshake I’ve had is from Whisk Creamery in Perth. It has really set a benchmark that I haven’t been able to top! S: The most unique “milkshake” I’ve tried was from Serendipity 3 in New York. Although not technically a milkshake, the frozen hot chocolate was the most interesting flavour, texture and presentation. Do you have a milkshake bucket list? S: Yes, I do have a milkshake bucket list! I got to tick some off the list when I went to America in February – one of them was the Shake Shack in New York (sadly, it disappointed me). I want to try some milkshakes in the UK eventually because I have a lot of followers and recommendations from there. One specific place I can’t wait to try is the Vogue Cafe in Sydney – luckily I’m going there in August. Did I mention Sam even has a TATTOO of a milkshake on his leg!? He got it while stateside at the Dolorosa Tattoo Company. That is love my friends. Pure love of the shake that is milk…and ice cream.